SDO is GO: Is the Sun Getting Brighter? I was asked whether SDO measures the total output of the Sun and whether an increase in that output could be causing the temperature of the Earth to increase? SDO was built to study how the magnetic fields of the Sun are created and destroyed. AIA and EVE look at wavelengths of light that tell us a lot about those magnetic fields but are absorbed by our atmosphere and can’t be measured at the surface. HMI is designed to measure the velocity and magnetic field at the surface, not the total output of the Sun. Other satellites in NASA’s fleet do measure the total output of the Sun, which we call the Total Solar Irradiance or TSI. 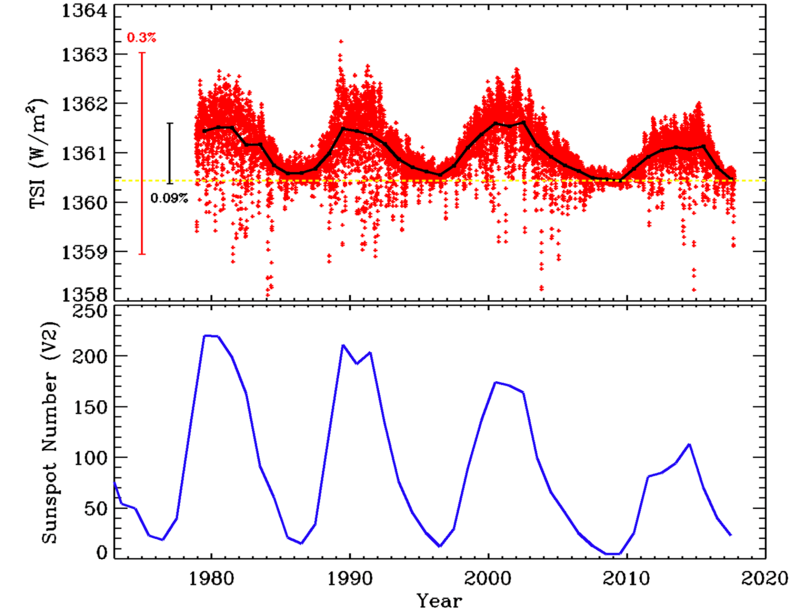 One instrument on SoHO called VIRGO has measured TSI since 1996. Another instrument is TIM on NASA’s SORCE that is operated by the same group that built EVE. SORCE was very carefully calibrated and used to establish the baseline of TSI. VIRGO and other earlier satellites then provide the data since 1978. Combining these data into a single measurement has been a challenge, but the people at LASP and the Physikalisch-Meteorologisches Observatorium Davos (PMOD) in Switzerland have risen to the task. The result is this figure. It shows the measured value of TSI from many satellites, spliced together into a single data set. In the top plot, we drew the daily average of measured points in red (so there are a lot of points, 14187 to be precise). On the left is a red vertical bar showing a 0.3% change in TSI. The black curve is the average of TSI over each year. The dashed horizontal line shows the minimum value of year-averaged TSI data. The vertical black bar shows the 0.09% variation we see in that average. The bottom plot shows the annual sunspot number from the SIDC in Belgium in blue. What do we learn from these plots? First, TSI does change! That’s why we stopped calling it the solar constant. Second, as the sunspot number increases, so does TSI. But the converse is also true. As the sunspot number decreases so does TSI. We have watched this happen for four sunspot cycles. This waxing and waning of TSI with sunspot number is understood as a combination of dark sunspots reducing TSI below the dashed line and long-lived magnetic features increasing TSI. SORCE has even observed flares in TSI. Third, the horizontal dashed line is not an average, it is drawn at the lowest value in the year-averaged TSI data (that happened in 2009). When there are no sunspots the Sun’s brightness should be that of the hot, glowing object we always imagined it to be. We would expect TSI to be the same at every solar minimum. There is much discussion over whether the value of TSI at solar minimum is getting smaller with time, but it is not getting larger. These data show us that the Sun is not getting brighter with time. 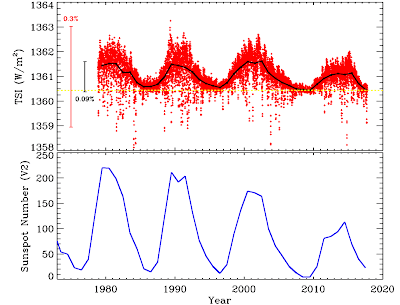 The brightness does follow the sunspot cycle, but the level of solar activity has been decreasing the last 35 years. The value at minimum may be decreasing as well, although that is far more difficult to prove. Perhaps the upcoming solar minimum in 2020 will help answer that question. To answer the question: No, we do not measure an increase in the output of the Sun that would cause the Earth to warm. More information about the VIRGO instrument and how the composite (“spliced”) data is generated from the many measurements is at the PMOD website. The data I used was downloaded from ftp://ftp.pmodwrc.ch/pub/data/irradiance/composite/DataPlots/composite_42_65_1709.dat. I highly recommend looking at the SORCE website for their data, which is how the absolute value of the composite was determined http://lasp.colorado.edu/home/sorce/. The sunspot data is from http://sidc.oma.be/silso/datafiles. You can download the sunspot number is several formats for your analysis. Note: Both data sets mark days where a measurement was not made with a negative number. These points were ignored when doing the averages. Why Look at the Sun from Space?